Excellent concept – there are times when we run our diesel trucks all day long to keep our foam cans warm. The Caulk Warming Bag will solve that problem. Just wanted to say thank you for designing a “Nice” heavy duty warming wrap to keep our 5 gallon buckets of material warm in cold weather, along with our foam tanks up to maximum temperatures for the best expansion possible all year around ! Greatest invention since sliced bread! Paid for itself in two days! As a professional contractor, I have been using my original Caulk Warmer since 2007, and it works as well today as the first day I got it! 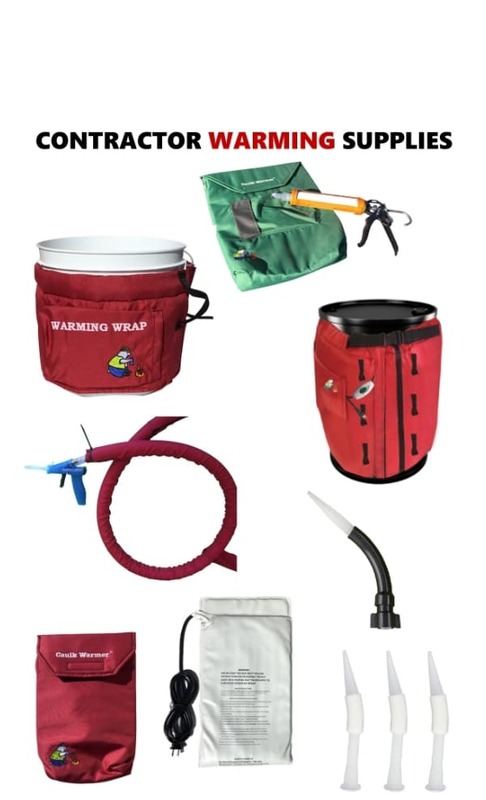 The Caulk Warming Bag is a great idea. This will be well received, is much needed, and will save users money. I used the hose warming sleeve for our foam cylinders, was having problems with foam consistency in the winter. Warming sleeve works great. I’m a painter in Michigan and this pail warmer keeps our paint nice and warm during the cold months. Keeps our mixtures ready to use, definitely a time saver.